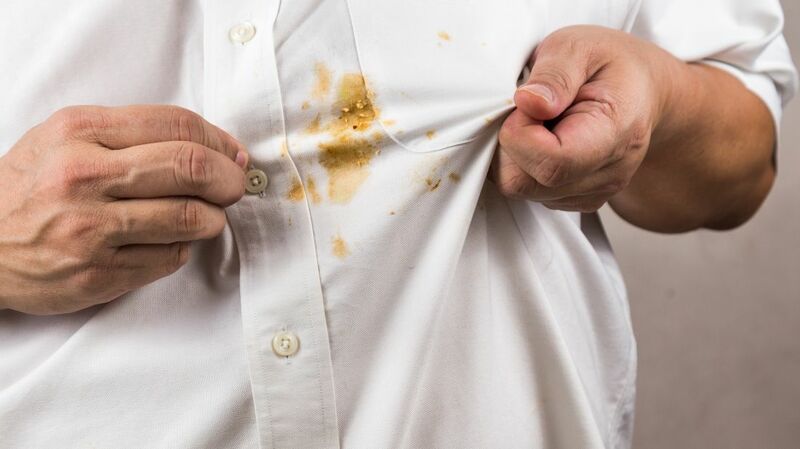 One of the hazards of an afternoon spent scarfing down burgers at a backyard barbecue is that you might unwittingly end up with a big ol' grease stain on your shirt. While you might be tempted to give up immediately and throw the garment into the trash along with your burger remnants, there's a simple way to fight even the most unsightly grease stains: Break out the liquid dish detergent. It makes sense if you think about it: Dish soap is great at fighting grease on your plates and silverware, and the same goes for grease on fabric. Per Emma Christensen at The Kitchn, the best way to treat a grease stain is to dab the area with some liquid dish detergent (petroleum-based products like Dawn or Sunlight work best), then rub it in. Let the item sit for a few minutes so that the soap can do its thing, then put it into the washer as you normally would. Voilà, your T-shirt is good as new! This method even works on old stains, so you can rescue all the nice clothes you've had to banish to the domain of around-the-house wear. Christensen also adds that the dish soap trick is great on oil paint stains. Word to the wise: According to a more in-depth article from The Kitchn, eco-friendly and all-natural detergents don't work as well. Want to learn how to treat every other kind of stain while you're at it? Here are some tips for tackling 15 other common stains.